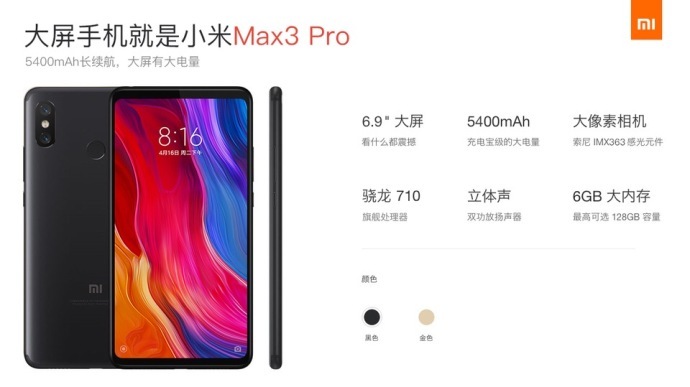 Details about the Xiaomi Mi Max 3 Pro has surfaced in China. The smartphone is rumoured to pack 18:9 display, a Snapdragon 710 SoC with 6GB of RAM, dual rear cameras as highlights. This new leak suggests that Mi Max 3 Pro could be any of the models that were certified by TENAA last week. Earlier this month, Xiaomi Mi Max 3 with model numbers M1804E4A and M1804E4T got certified by TENAA. However, the latest render and hardware specs do not match with the TENAA listing. It doesn’t show the earpiece and front camera and TENAA listing revealed that the phone was having Snapdragon 636, however, other specs including the 5400mAh battery are expected to be similar. As per the leaked specs sheet, Mi Max 3 Pro will sport a 6.99-inch FHD+ (2160 x 1080 pixels) IPS 2.5D curved glass display with 18:9 aspect ratio. It will be powered by an Octa-Core Snapdragon 710 10nm Mobile Processor with Adreno 616 GPU and with up to 6GB RAM and 128GB storage. In the camera department, it will sport a dual rear camera with 12MP primary Sony IMX363 sensor having 1.4µm pixel size, dual-tone LED flash and a secondary sensor for depth effects. For selfies, it will have an 8MP front-facing camera. The Dual SIM phone will run MIUI 9 based on Android 8.1 Oreo and it will also be upgradable to MIUI 10. For connectivity, the phone will have features like 4G VoLTE, Wi-Fi 802.11ac (2.4 / 5GHz) MIMO, Bluetooth 5, GPS + GLONASS, and USB Type-C. It will pack a 5400mAh battery with Quick Charge 3.0 support. The Xiaomi Mi Max 3 Pro alongside Mi Max 3 could be launched next month as confirmed by Xiaomi CEO. However, there is no official confirmation about this new Mi Max 3 Pro. Also, just like the previous year, it is expected to come to India soon after launch in China.